Home > Blog > Go Fish! If you love fishing then you’re sure to love today! It’s National Go Fishing Day! Meant to be spent fishing and nothing else, today encourages everybody to pack up your poles and tackle box and spend the day casting your line out into the water. Fishing may reap the reputation of a ‘boring sport’, but when you’re out there all day, some pretty wild things are liable to happen. Read on to learn some pretty interesting stuff about the world of fishing. Whether you’ve never been fishing before or you’re a seasoned a-FISH-ionado, you’re sure to find these facts on fish rather fantastic. Our first fun fact comes from delicious fish—people find fish delectable the world over. Somewhere in our 7000 taste buds, we’ve really developed a taste for fish. But did you know that most fish wear their taste buds all over their bodies? That means they can taste things just by coming into contact with it. I’m pretty happy with the location of my 7000 taste buds being on my tongue, but catfish make me jealous, boasting 27,000 taste buds! It was never an easy thing to tell how fast certain fish can swim until some fishermen conjured up a simple method. Here’s how it works: when you get a bite on your line and the fish takes off, measure how much of your line comes off the spool in a certain amount of seconds. Some elementary mat hematics will calculate the speed of the fish. The fastest fish ever in the world is the sailfish which took 300 feet of line within three seconds. It swims at 68 mph. That’s one fast fish! 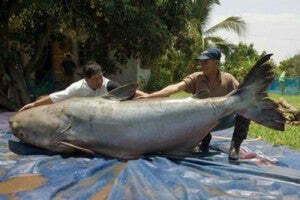 The largest freshwater fish, the Mekong giant catfish, measured in at 646 lbs. and nine feet in length. That’s roughly the size of a fully-grown grizzly bear! That’s a big fish. 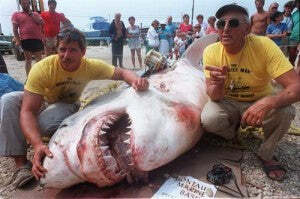 But that’s nothing when considering the biggest fish ever caught including saltwater—a 3,427 pounder! It was a Great White Shark. The inspiration for Captain Quint from ‘Jaws’, one Captain Frank Mundus is responsible for reeling in the shark—the largest fish to ever be caught by rod and reel! So, you see, fishing may have plenty of downtime, but when the other shoe drops, it can make for a pretty wild time! Get out there and catch the biggest fish you’ve ever caught and, as always, thanks for reading.